Last night I attended Facebook’s annual F8 conference – their yearly chance to show off new features that will, in the words of Mark Zuckerberg, “change the world”. I’d already had some exposure to the new features, having been a “partner developer” through my role at the Guardian (whose app you can check out here). While the things Zuck demoed for the audience weren’t new to me, the way they were packaged up and sold was quite an eye-opener. First: Timeline. Already there are blogs and news sites praising and/or castigating it, and some even instructing impatient users to create fake developer apps so they can see it early. (ironic aside: I’m a “Facebook approved” developer and I still don’t have it, despite Zuck’s promises). There’s probably been more written, tweeted and discussed about this feature than anything else they’ve done this year and it’s only day one. 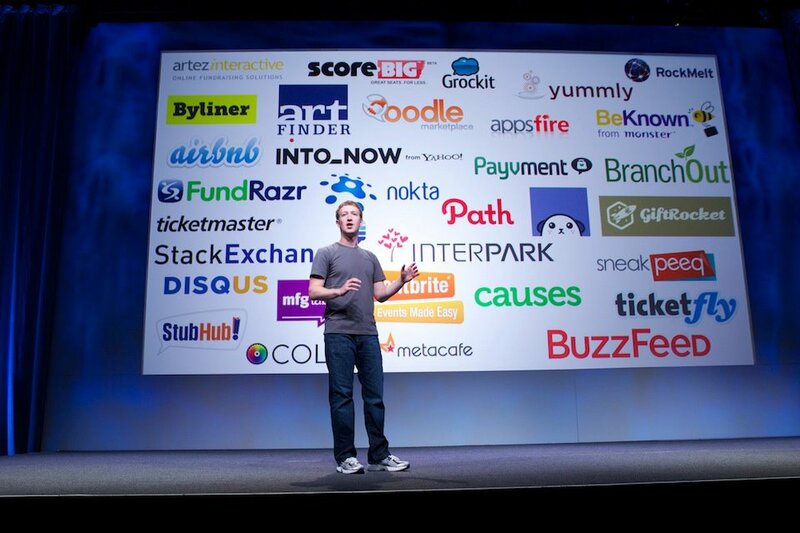 The end of Zuckerberg’s presentation on Timeline was the most telling. A video with a movie montage soundtrack was played, showing the years of a user’s life flash by in a whirl of scrollbars. We saw a young couple become engaged, married, then having a child, who then grows up and learns to walk and talk. Like Apple’s advertising, it painted this beautiful picture of how we’re all supposed to pretend modern life is. Look, Facebook was telling its users, now all those photographs you mindlessly take of everything you see can be neatly categorised and documented! Now when your instinctive response to grab your iPhone and record a video of your child’s first achievements kicks in, you have somewhere to upload it to! It’s been pointed out before, but Zuckerberg’s insistence that the ultimate goal of social media (or even the internet itself) is to turn ourselves into digital archives was hugely represented by Timeline. Zuckerberg explained the evolution of the profile as a conversation: the wall was like a quick introduction, the expanded profile with apps was a longer conversation, and Timeline will be like sitting up all night and really getting to know someone. It sounds fantastic. Who doesn’t enjoy those kind of moments? But in all of those late night, setting-the-world-to-rights conversations I’ve ever had while getting to know people, none of it consisted of a back-and-forth chronology of “In 2006 I did this” and “oh, cool, in 1994 I went here”. Conversation, and by extension social interaction, is an organic medium and attempting to represent it using boxes and photos can only go so far. Doubtless Zuck and his cohorts would claim that Timeline isn’t meant to represent your entire life’s achievements, summarised in neat Facebook livery, but instead it should give users a way to learn about who we are. To this I wonder whether its users will see it that way. A considerable portion of Facebook’s userbase are unquestioningly happy to fill in every input field it offers them; to document every inch of their lives till no mystery remains. Once Facebook offer them a way to painstakingly record every significant event that’s happened to them, what more is left? Why bother with a heart-to-heart conversation when I can just look at your Timeline and know your entire character without exchanging a word or sharing a joke together? I can imagine millions of people proudly filling in Timelines and amassing tons of information, ultimately contributing nothing and serving only to make themselves less interesting. It’s an interesting thing to consider the diversion Facebook have taken after the challenge from Twitter: where Twitter forces users to economise and communicate with brevity and (hopefully) a consideration for relevance, Facebook is saying “tell us everything – whether people want to know it or not”. Onto the second new feature: the Open Graph changes and the Ticker. This was the part I was most aware of, since the Guardian app I worked on uses these new features to share what you’re reading. Again, privacy implications are high, but I imagine that this will have a marmite effect – younger people don’t tend to be as concerned with the notion of sharing everything they do, whereas older members tend to be more reserved and concerned. Like the Timeline, here again Facebook encourage users to increase the signal to noise ratio. Zuckerberg acknowledged in his talk that some friends post too many status updates, or end up “spamming” your feed. The Ticker aims to solve this by moving the spammy content to a designated place. What I found interesting here was that after recognising that a significant portion of their userbase use the site to overshare, rather than attempt to educate them and emphasise the sharing of things of value, Facebook have introduced a myriad new ways to allow users to spam one another. Zuckerberg spoke at length about music sharing in particular, highlighting the Spotify app as a great way to listen to new music. I’m a wholehearted devotee of social discovery for music – some of my favourite artists are recommendations from friends – but this is different. Sure, if every song my friends are listening to appears in my Ticker, then statistically it’s more likely that I’ll click on one I like. But music and sharing aren’t statistics, Mark. I don’t want to tell my friends about every single song I’m listening to. I listen to a lot of weird music. My family and friends don’t want to listen to Throbbing Gristle records or experimental Norwegian jazz (ooh, check me out). If I hear a song that makes me think “hey, Sarah would really like this”, I’ll drop her a line with a link to the song. As Ticker develops and more apps begin to write stories to it, I wonder what Facebook’s response will be. Will they invent a new overspill function to take the run-off of spammy stories? What happens when Farmville and the rest begin to use it? Where does that funky video of people discovering new recipes go when every other story is “James just gave you a unicorn!”? In that video clip we saw users cooking meals and seeing each others’ activity. Is this the end goal of this communications network we’ve developed? As I cook a meal with friends should I keep my iPhone in one hand constantly so I can make sure the world knows I’ve just cooked Rainbow Chard? Or eventually will there be an app that can automatically determine what I’m making based on my grocery purchases and kitchen temperature? Facebook probably hope so. As you might imagine, I’m something of a Facebook sceptic, leading to me deleting my account earlier this year. These new changes are interesting: the potential for new and cool apps is quite high, and it seems to me that Facebook’s userbase is the real product owners: they determine how these things get used. But there’s still something underlying about all of this which gives me a certain sense of unease. When we become so ‘social’ that everything we do is digitised the instant it happens – or even while it’s occuring – what are we emulating? Facebook began as a way of simulating a conversation, Zuckerberg told us. What is it simulating now?